What could be the probable lesion ? Name the causative organism ? How is this disease transmitted ? Why is the mass presenting at the choana ? Probable diagnosis is antrochoanal polyp. What is this line called ? What is its use ? It is known as the Ohngren's line. It is an imaginary line drawn from the medial canthus to the angle of the mandible. 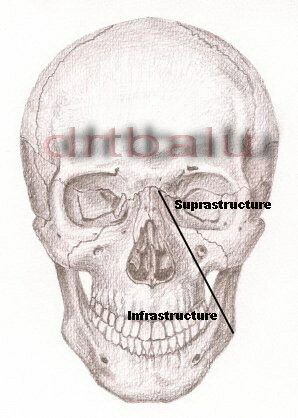 Structures above this line are called suprastructures and below this line are called infrastructure. 1. Soft boggy swelling over left forehead. What type of fracture is this ? What is the status of palate in this patient ? Name the structure illustrated with an asterix. 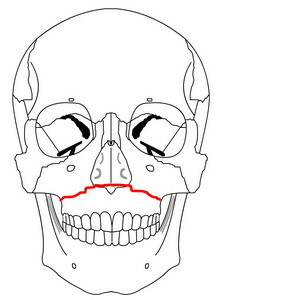 How do you differentiate this structure from the frontal process of maxilla? It is the uncinate process. It is a boomerang shaped bone, sagittally oriented. It is mobile as compared to the frontal process of maxilla, which is immobile. Comment on this histopathology slide. 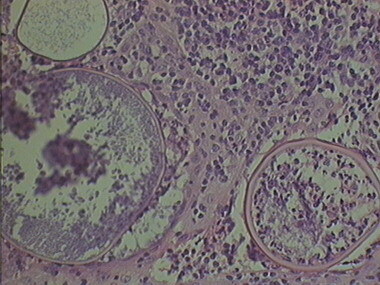 This slide shows double walled sporangia containing spores. Surrounding stroma shows dense collection of inflammatory cells. Name any 4 nasal complaints of sinonasal malignancy. 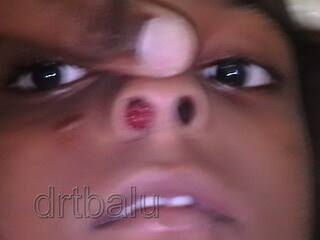 What could be the rhinological causes of this condition? 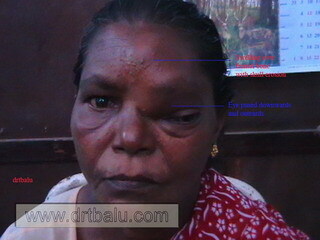 This patient is having total ophthalmoplegia of right eye. The right eye appears frozen, while the left one is mobile. paranasal sinuses cause this condition. What is Bernhard Fraenkel triad? It is present in patients with atrophic rhinitis. Given below is a DNE picture of a patient. C/o Bilateral nasal obstruction since childhood. Comment on the DNE picture. What syndromes you would like to rule out in this patient? Probable diagnosis - Choanal atresia.